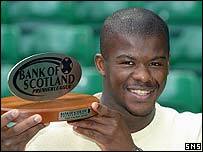 Celtic's Bobo Balde has been named Bank of Scotland Premier League Player of the Month for April. The strapping centre half has been in excellent form for the Parkhead side as they progressed to the Uefa Cup final and got the defence of their league title back on track with a win over leaders Rangers. It is the second award this week for the former Toulouse defender, who was named as the club's player of the year by the supporters. "I am learning all the time because I am playing with good players," said the Guinea international. "I have got the confidence to play in front of 60,000 people so thank-you to them." Striker Henrik Larsson collected the players' player of the season award at Celtic Park. Scotland Under-21 international Shaun Maloney earned the young player of the year while John Hartson won the Celtic goal of the season prize for his strike against Liverpool in the Uefa Cup at Anfield.